Last night my intent was to continue working on the beast of a presentation that has had the management committee all fidgety (came in at a whopping 64 pages this afternoon). The problem is that my bed is a mere 5 feet away from my desk and you know how that works. After napping for about 30 minutes, I decided to get a bike ride in to get the blood flowing. Initially, riding to the Fort Greene Park and exploring it was my only goal. But I didn't feel awake enough yet so I ended up riding to and exploring the DUMBO area which Zan and I had planned on a few weeks ago. Cobblestone roads don't make for good bike paths, especially road bikes. I don't get why DUMBO is now Brooklyn's priciest area to live in. I wouldn't hesitate to choose Brooklyn Heights over this area. 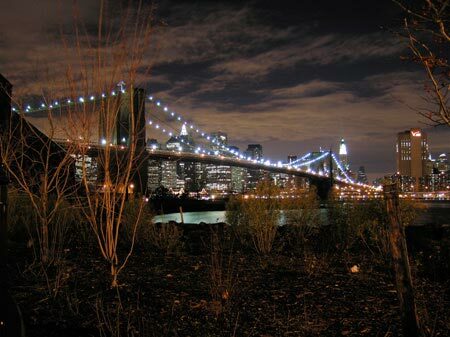 The Brooklyn Bridge Park is tiny, but intense in its views of lower Manhattan. My phone's camera no longer works and I'm too lazy to format it and reinstall everything, I also didn't have my regular digicam with me so I have no photos to share. Anyway, one of the more striking contrasts was of Gleason's Gym. Located right above a West Elm (just close your eyes and imagine a bright, clean, expensive looking retail store, with an old dusty, ragged boxing gym above it). My next stop was the lower end of Brooklyn Heights. Grimaldi's wasn't as packed as usual, but I only had $10 with me and I didn't feel like stuffing down an entire pie (they don't sell slices). I did come across the Brooklyn Ice Cream Factory though. But with no bike lock or anyone to watch my bike, I was unable to satisfy my craving. So in the end, I ended up doing the logical thing. I got back on my bike and rode over the Brooklyn Bridge and to the Chinatown Ice Cream Factory. On the way there I passed by City Hall and saw that an event was going on for the Tribeca Film Festival. I love it when they space out candles all along the steps. Saw the same thing at the MET last year. And that was my evening... now for the presentation. If you haven't been watching the Avatar on Nick, I feel for you. The second season began a month back, there's five episodes out right now and you can probably find all of them as torrents. Fifth Gear's season also started. Three episodes so far and you can find the torrents through Final Gear. I can't wait until The Transformers: Evolution comic series, comes out! Did I already cover this? I think I did. Free Comic Book Day is coming up in a week! Saturday, May 6th this year. Cool turtles! I should have gotten Tomo to pick me up a few this past winter. i think jeremy canceco has those turtle things. i saw the marketing video on that on the toy's website. MAJOR LAME! don't worry, you're not missing out on much.